Day Anti-Aging Cream Pond's Age Miracle Cell ReGEN Day Cream - a specially developed product for aging skin. The cream Age Miracle Cell ReGEN Day Cream includes an innovative component of the Pro-Cell Complex, which helps to restore the skin and eliminate signs of aging skin. Innovation Pro-Cell Complex reduces the depth of facial wrinkles and erases their clean lines. Pro-Cell Complex stimulates the protective functions of the body, stimulates the removal of toxins and moisturizes. Cream with anti-aging effect prolongs the life of cells in the epidermis of the skin and reduces the symptoms of fatigue. Day Anti-Aging Cream Pond's Age Miracle Cell ReGEN Day Cream is designed for skin after 35 years as the age of the signs of aging is very noticeable. Active ingredients day cream from Pond's stimulate the production of collagen and elastin, which helps to improve skin condition and strengthening supports the skin's tissues. 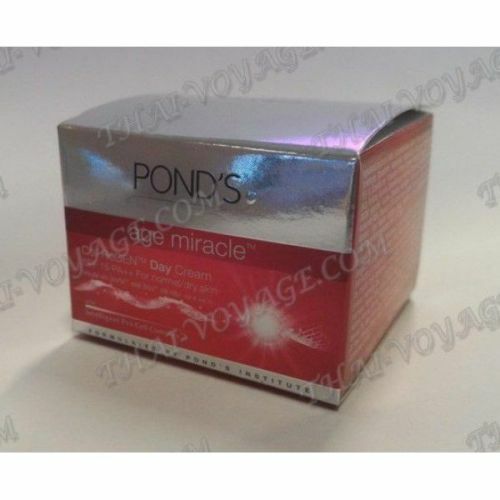 Anti-Aging Cream Pond's Age Miracle Cell ReGEN Day Cream eliminates age spots and pigmentation. The skin becomes more supple and elastic. Within seven days of regular use of anti-aging creams age spots become fainter, and soon disappear altogether. Day Anti-Aging Cream Pond's Age Miracle Cell ReGEN Day Cream contains UVA and UVB protection SPF 15 PA ++, that allows you to be happy and enjoy sunbathing without negative consequences for the skin. Miracle Cream Pond's company gives the skin radiance and shine, evens out skin tone. Texture anti-aging cream is very light and delicate. - For the restoration of the skin. Application: Apply the cream with light tapping motion, moving from a chin-up on the massage lines, to cleansed face and neck in the morning. Apply a day cream is recommended daily. The cream is suitable for all skin types. The cream is very convenient and economical to use.